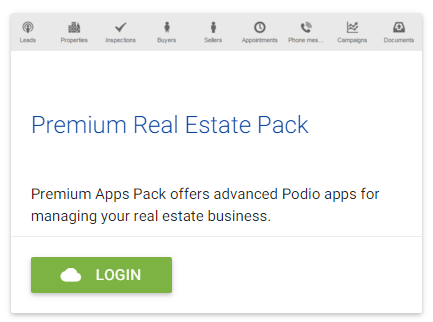 We’re happy to announce the new Premium Podio Apps Pack for real estate professionals. The pack includes the following apps that allow your team to get started right away. Most of the apps are interconnected, meaning you can link between them in your workspace. For example, Leads app items may contain references to certain Property app items that will be displayed as related items at the bottom of your screen. App relationships help you see more in just one glance. The Premium Apps Pack is available for a one-time fee of $19. Podio authorized partners and systems integrators.